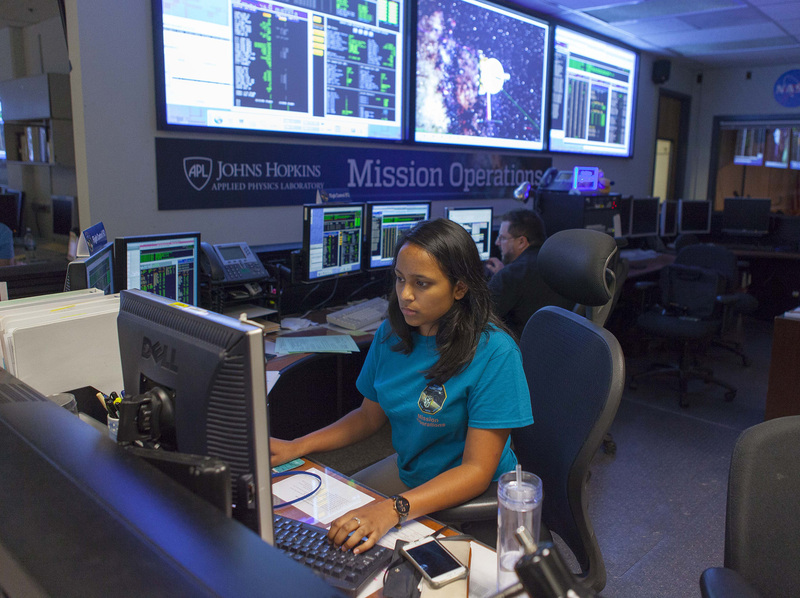 In the New Horizons Mission Operations Center at the Johns Hopkins University Applied Physics Laboratory in Laurel, Maryland, Priya Dharmavaram (front) and Tim Miralles monitor telemetry from New Horizons following a course-correction maneuver on June 14 that refined the NASA spacecraft’s path toward the Pluto system. New Horizons will make its closest approach to Pluto on July 14; the maneuver kept the spacecraft on track toward an “aim point” approximately 7,750 miles above Pluto’s surface. Now within one month of the historic Pluto flyby, NASA’s New Horizons team has executed a small but important course correction for the spacecraft, completed updated analyses of possible hazards in the Pluto system, and is picking up the pace of science-data collection. Using commands transmitted to the spacecraft on June 12-13, the thrusters began firing at 12:05 a.m. EDT and stopped 45 seconds later. Telemetry indicating the spacecraft was healthy and that the maneuver was performed accurately reached the New Horizons Mission Operations Center at the Johns Hopkins University Applied Physics Laboratory in Laurel, Maryland, through NASA’s Deep Space Network at 6:23 a.m. EDT. With the spacecraft about 2.95 billion miles from home, the radio transmissions from its communications system need nearly 4.5 hours to reach Earth. In the last week of June, the Pluto approach enters its third and final far encounter science phase — called Approach Phase 3, which runs until seven days before Pluto close approach.